Your Rojak Portfolio and How to Fix it. Over the years I had the chance to take a glimpse at some of my friends, family and co-worker’s portfolio. And often it looks like a mesh of financial assets that is all over the place. Sometimes, I can bring up some financial assets that they have, which they totally forgotten about. And a lot of people forget what they purchase. For some, these are on recurring payments, and it is only perhaps until the 3rd month of net worth tracking that they realize they were paying for it. Rojak is nice to eat. The end result is that you feel less confident about your financial situation. When you feel less confidence about your financial situation, often that permeates through our daily lives. From my experience, this is how things happen most of the time. Your spouse and yourself, or you alone comes across some financial assets, or way of investing that is “interesting”. You find out more, and the person that explains or markets this to you shows you the advantages and disadvantages. For most people, they tend not to think about their investments all the time. Due to that, you tend to forget a lot of the advantages and disadvantages of the financial assets that you currently own. So this new financial assets look very favorable versus the existing ones. The second thing is that, people tend to invest on the available cash concept. People tends to have an issue comparing the pros and cons of their existing investments with a prospective one. They cannot weigh the opportunity costs of not purchasing this new investment well. Thus they based their purchase decision on whether they have available free cash flow to put into this. When insurance adviser or financial services sales staff market things to you, they also know this and target this. I went to meet a POSB/DBS sales person and he recommends that I do not touch my net worth, but just contribute from my future recurring disposable income into this retirement product. What happens in doing investing this way is that you keep adding on a differentiated financial asset to your portfolio. One day, due to other mandatory and discretionary spending, and slower income growth, all these will come to a stop. And you realize that you have a very messy portfolio. It could resemble something like this. Some of them are due to lump sum purchases and some are based on recurring income. The first thing is that we usually do not have a baseline competency on how to manage our assets in a portfolio. We often buy with the idea that what we have just purchase could be the holy grail of fuss free investing with adequate returns. Or what I would term a passive wealth machine. When the performance dips, you get disappointed but don’t do anything on it. You become risk seeking and wait for the investment to turn. You did not review all your investments, because you do not know how to review. If you were to sell and re-balance it to something else, you do not know whether you are making the right move. So usually, the likely people with the competency to sort this out is someone you think that is competent in doing this, which is a financial adviser, investment specialist. If the person is competent and have integrity, then you might get it sorted. However, a lot of times, what I notice is that advisers are remunerated for products sold, not by their time spend on your case. Spending time figuring out your situation is a cost to these advisers, and if they do not charge accordingly how do they sustain this? So often, what happens is that the adviser re-balance some of your assets into a product they can recommend. If the product is fundamentally sound and the adviser have integrity, you are in good hands. Most of the time, your portfolio will get more rojak. For my non Singaporean readers or those that are not peasants, rojak is a delightful dish that looks very messy. It is bad up of some vegetables and youtiao (chinese doughnut stick), coated with a sweet paste mixture with peanut. 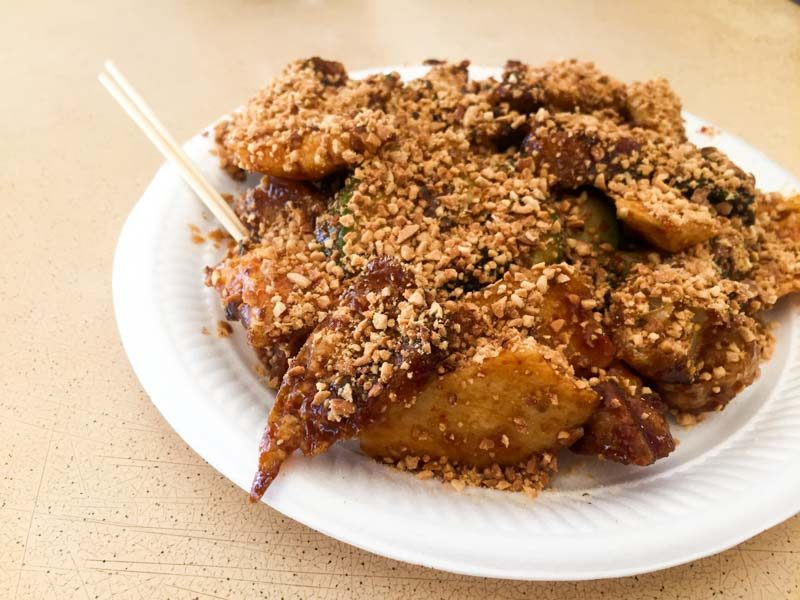 Soon, we Singaporeans start using the term rojak to describe things that on the surface, look very messy and do not make sense. You only hope that your portfolio will taste as good as a plate of rojak. So how do you fix a portfolio like this. I have seen enough readers fix things by getting their act together and start taking ownership by building up their competency. Then they start biting the bullet and cutting out the financial assets that do not make sense. And start re-balancing their assets, channeling their free cash flow to more fundamentally sound financial assets. They also ask a lot of questions that show their vulnerability on how the right approach should be. I find that read a book that have a focus on portfolio allocation do help. It is difficult to pick up adequate knowledge here and there through blog articles. The easy to read books tend to be the books that focus on index investing. One good book that I came across recently is Rick Ferri’s All About Asset Allocation. Rick Ferri is a investment adviser who built up a company based on low cost, passive, evidenced based investing. So this book would explain how do you look at the core asset classes from the point of view of a portfolio. If you are an exchange traded fund investor, this might be up your alley. The other way, is as I have mentioned, to find a competent adviser. As I written last week, there are certain core characteristics that you need to look at for such a firm or a person. Most of the time, the way I see is that you end up with another sales agent. To give you an example, my friends have unbelievable trust in their adviser, but when they tell me what their adviser is doing, it seems the adviser is making tactical shifts in their portfolio. I am not in the position to evaluate but largely I have a distrust for tactical bets, unless its done by someone I know. Even then the result have been hard to quantify. If you wish to fix your portfolio, you might look to my friend Wilfred Ling at IFA.sg. Wilfred is a fee based financial adviser and have a lot of experience in these form of restructuring. However, it is likely that you will need to pay a fee to get things in order. Consolidating under him is not a bad proposition considering he has a stable of investments and protection products that he can recommends. In recent times, I understand that he is also have available Dimensional Fund Advisors (DFA) evidenced based funds. If you would like to find out more, here is my affiliate link to one of his package at 50% discount (worth up to $750). We do not know if you are the right fit, so just give him a call to find out. Whether you make use of his services, or another adviser service, a large part of why the situation because like this is because of a lack of attention to your wealth. You might wish to do something about the lack of competency if you have done a regular annual review. One of my past strong recommendations is not to start budgeting but just to track your net worth. Sooner or later it will bug you to wonder what the hell were you doing. My last point is that if you choose not to spend adequate effort, then the result often will reflect that. learning to sell it off is also a psychological training. I identify with this article and confess that I am one of those who is guilty of a rojak portfolio as I have so many counters spread amongst 4 custodians (CDP, SCB, Interactive Brokers, and FSMOne). On the other hand, because i have so many counters, its hard to keep track of the price of every counter so I don’t bother checking regularly, which is a good thing haha. When it comes to ‘cutting’ a rojak portfolio, I think the question I often ask myself is whether I am prepared to accumulate more of the counter. If I am prepared to continue accumulating, then perhaps it should remain in my portfolio. However, its hard to sell because my counters are mainly dividend stocks that are declaring dividends regularly. Hi Lim, that is the problem plaguing a lot of people. The sunk cost question is a good gauge and you are right it requires some guts!